How to Get from Faro Airport to Islantilla? If you are planning on travel to Islantilla, Andalucia one of your options is to arrive at Faro Airport. Once there, unless you know someone in the Costa de la Luz you will certainly need a transport to Islantilla. If you want to avoid all the hassle of catching an Algarve public bus to Islantilla carrying your luggage around and if you are not willing to wait in lines and pay for expensive normal taxi fares to Islantilla, your best option is to book online a private Faro Airport transfer to Islantilla. book with confidence. FAO certified provider. Select Islantilla as your transfer destination area and provide us with flight details, Islantilla accommodation address and contact. We automatically process your request for transport availability to Islantilla and send you a booking voucher with transfer confirmation in a few seconds. At Faro Airport arrivals hall a friendly driver will be waiting for you next to our company sign. For the return transfer we will pick you up from the same address in Islantilla. And remember, you can always pay later to the driver for both your arrival and return Islantilla transfer. How far is Islantilla from Faro Airport? How much will it cost? How long? The travel distance between Faro Airport and Islantilla is 90Km and transfer time takes approximatly 94mins under normal traffic conditions. For better service response we may choose a route to Islantilla through the highway. Our private Faro taxi transfers to Islantilla have fixed rates and represent a much more faster, affordable and hassle free alternative transport to Islantilla. A friendly driver will meet and greet you at Faro Airport arrivals hall. He will assist you with all the luggage and guide you to your assigned Islantilla transfer vehicle, which may vary from an executive saloon or estate car for up to 4 passengers to a modern people carrier van or mini-bus up to 19 passengers. In approximately 70 minutes you will be relaxing at your Islantilla resort, hotel or private villa. Welcome to the Costa de la Luz! 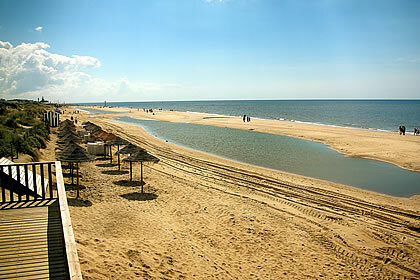 Islantilla resort is located over a sand barrier between Lepe and Isla Cristina next to the Guadiana estuary. Facing the sea Islantilla was the product of a public investment in the area focused on tourism. It was built to provide everything a tourist needs for the perfect holidays. Golden beaches and calm warm waters are the perfect environment for all kind of nautical activities. Accommodation is supported by a large choice of hotels and holiday apartments for all budgets. Playing golf at the Islantilla Course is always an alternative to the beach. Our private transfer service at Faro Airport will transport you directly to and from any resort, hotel or private holiday villas / apartments in the Islantilla area: Isla Cristina, Ayamonte, El Rompido, Islantilla Golf Resort, Isla Cristina Palace Hotel & Spa, Confortel, Oasis. To pre-book taxi transfers from Faro Airport to Islantilla or to other near by destinations take a look at our full list of taxi transfers fares & prices for all the covered locations in the Algarve and Southern Spain. We cover the entire Algarve area or any other location in Portugal and also Spanish locations nearby the Portuguese border. How to find us? Simple. We are here to help you put together those final touches of your well planned holidays. According to the flight details provided in your transfer booking, we will monitor your flight status and wait until your arrival, even if your flight is delayed - no extra charge for long delays either. Our driver will be holding a white board with your name. Is that simple! No waiting in lines and no last minute hassle to get that final transport. We believe that the first hour in any country is important to set the tone for the rest of your stay. We will meet and greet you at Faro Airport. See you soon! Our Faro Airport transfers staff is easy to find once you leave the luggage collecting area. They all wear light blue shirts and your assigned driver will be standing next to our company stand holding a sign with your name. He will welcome and guide you to your transfer vehicle outside.